Over the past ten years, Salesforce has made AppExchange the #1 business app store where customers can find the apps, components and more to extend their CRM. Julie Lyle, CMO Advisor at DemandJump, takes the stage with other innovative AppEx partners, and moderator Hana Mandapat, to learn about the latest trends and new technology for ISVs, AppExchange Partner Program updates, and go-to-market opportunities in the $859B Salesforce Economy, to grow your business over the next decade. Hana: Last but not least I’d like to welcome my last guest Julie Lyle who is the Chief Revenue Officer and Chief Marketing Officer for DemandJump. Now, DemandJump is a cloud platform that uses AI and data science to analyze your competitive digital ecosystem. So Julie welcome to Dreamforce and as I remember, it’s your first Dreamforce correct? 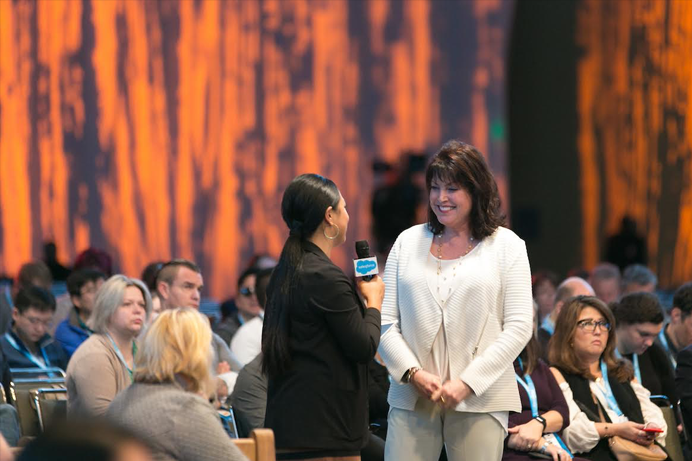 Julie: It’s not my first Dreamforce, but it’s my first time speaking at Dreamforce! Hana: First time speaking at Dreamforce! Well, welcome! So Julie, DemandJump is one of our newest partners on the app exchange. You just came onboard this year and you are actually one of our marketing cloud partners which a lot of folks in the room may not know that’s another way ISV’s can partner with us. So tell us about why you chose Salesforce and specifically the marketing cloud side of things to partner with us. Julie: Well there’s really two reasons that we chose to partner with Salesforce. First of all, of course we wanted to partner with a market leader in delivering SaaS solutions across industries especially as it relates to the marketing cloud. Secondly, the breath of catalogue that Salesforce has in their solutions are largely targeted at conversion, upsell, cross-sell etc. whereas DemandJump wholly focused on identifying new-to-file, highly converting, qualified customers so we’re able to fuel all of the solutions that Salesforce delivers for your customers. Hana: That’s great. Now you have an impressive track record yourself. You used to be the previous Chief Marketing Officer at Wal-Mart and Prudential, so as a tech leader in these large companies, talk about how the role of a channel strategy and partnership actually helps you with growth not just at these large companies but also for small businesses. Julie: Well thank you Hana. What I have learned whether you are an executive at Fortune 1, like Walmart, or whether you are in a startup business, partnerships today are essential to success and to accelerating your growth in the marketplace. I’ll give you an example. With Salesforce, and just the retail vertical alone, DemandJump partners both with Salesforce and with Accenture, sort of like three legs on a stool. And what Accenture brings to the table is immediate, credible access to some of the leaders in C-Suite and Fortune 100 businesses. What DemandJump brings to the table is deep marketing expertise as well as insights that start to deliver traffic and revenue increases day two of the engagement. And then, of course, Salesforce brings their broad catalogue of solutions for more complex challenges that the retailers or other vertices are facing, so together we’re a trifecta that delivers value not only for the companies themselves, but for their customers.